Writing is a displacement, or at least that is what I feel when I delve into a text. I need to move my boundaries, expatriate myself from my habits and immerse myself in difference. It is not a metaphor or some stylistic exercise. What is leaving ? What does emigrating mean ? How can we meet another culture ? How can we connect with that which is « other » ? How can other European countries’ concerns meet or feed my own thoughts about our society or give me another point of view that can decentralize my ethnocentric mode of thought ? The exploration of these questions underlies my entire work, which is about intimacy and how better to reach the universal in our humanity. The border between self and other can be the same as the border that divides two territories, two people with different social and cultural backgrounds, or be merely skin deep. To these somewhat reasonable motivations I add the desire to be surprised, the desire to make new encounters that will unsettle my work and enable me to redefine it, the desire to be open to new working methods I have never known before, the desire to meet people that will open up new horizons and create new collaborations. See below all the activities involving Aurore Jacob in the frame of Fabulamundi. 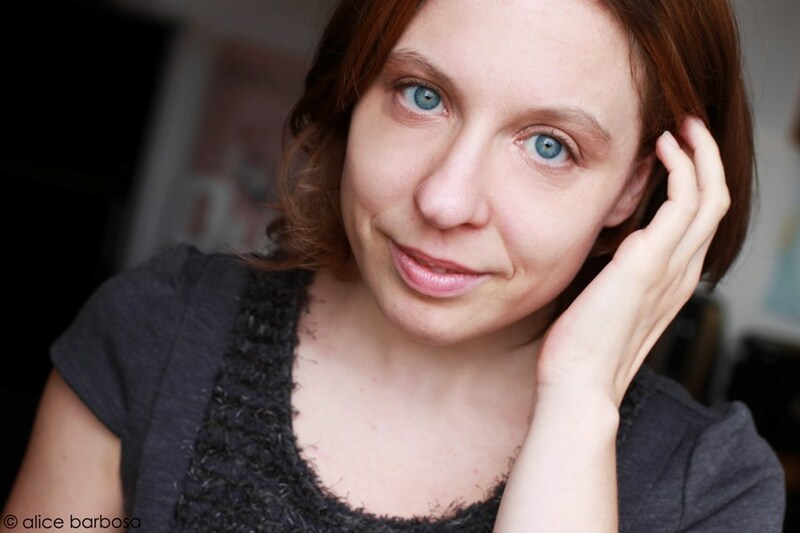 After obtaining her Master’s degree in theatre from the Sorbonne, Aurore swapped theory for the stage. She has written twelve plays, some of them published by Théâtre Ouvert, Lansman, Koinè and En Acte(s). She likes to shake up her writing habits by writing directly on stage, as she did for the F3 project, now in production, and for which she has been working with Solenn Denis and Julie Menard within the context of laboratory work for alternative societies for Oh ! le Collectif de la surprise, scheduled for 2017. Alexandre qui ? ou l’histoire d’une rencontre entre le Népal et le Ventoux, reading staged EPAT with CNSAD students, Théâtre Ouvert Paris, 2017 – Selected by Ecritures Théâtrales en Chantier, Moulin du Marais. Alexander qui ?… revolves around the figure of Alexandre Juillet. We follow Alexandre Juillet in his everyday life, one of the banalest. From his home, located at 39 bis rue des Palissades, to his position as a telemarketer within the customer service of Ventoux, we followed him. Alexandre Juillet was a perfectly normal citizen. It would seem, in fact, that Alexandre Juillet is at the head of a terrorist movement opposed to our society of progress and consumption. It’s what we say. Unless it is a spontaneous and global combustion movement. In this sprawling play, space and time become elastic, the private mixes with the public and the destinies of all bind to resonate. We slip alongside Alexandre Juillet, who focuses all the eyes and pass with him from reality to a hallucinated vision of the real, as in a waking nightmare. Unless it is only an epiphenomenon of a civilization swinging off the other side of the mirror. As she was waiting at the bus station a woman has been kidnapped. Detained in an unknown location she tries to figure out how to get free. She speaks to her captors threw the jail door but with no answer. She gets mad with terror as fear increases again and again. She blows a fuse and blames herself and finally concludes she deserves to be hurt and abused. Her words are getting confused, unclear definition, missing information, a lack of precise memories. Reality loses all its meaning. Time and space collapse. Her reality is erased. Is that the kind of reality you have to face up under a dictatorship (wrongful imprisonment, injustices, kidnapping)? Is that a nightmare? The playwright speaks with a true breath of emergency, the world she describes is a suffocating one threw an accurate and poetic way of writing. As she was waiting at the bus station a woman has been kidnaped. Detained in an unknown location she tries to figure out how to get free. She speaks to her captors threw the jail door but with no answer. She gets mad with terror as fear increases again and again. She blows a fuse and blames herself and finally concludes shediserves to be hurted and abused. Her words are getting confused, unclear definition, missing information, a lack of precise memories. Reality loses all its meaning. Time and space collapse. Her reality is erased. Is that the kind of reality you have to face up under a dictatorship (wrongful imprisonment, injustices, kidnapping)? Is that a nightmare? The playwright speaks with a true breath of emergency, the world she describes is a suffocating one threw an accurate and poetic way of writing. Wings without W revolves around a young girl, “W”. A girl who’s growing up too fast and fiercely and who cannot be held back. “W” cannot be labeled by others as she’s impossible to figure out. She’s always fleeting, as if running from something. It would appear to “W” that the costume of Childhood doesn’t fit her anymore – yet the burden of wearing an ‘adult’s mask’ is no easier a task. This is all we know about “W” – this – and the fact the she will eventually commit suicide. Wings without W comments on our society’s inability to manage or truly understand young adults. The piece observes how – in a society in which dreams are so easily destroyed – young people struggle to feel and find a place for themselves in this world.